The basic school system for education in Kenya is the same as in many other western countries, including the United States. It's referred to as an 8-4-4 system of education. In Kenya, the first primary school level lasts for 8 years, then there is 4 years of secondary school. After that, there may be 4 years of college or university for those who can afford it, and have high enough grades. Enrollment levels drop dramatically after the primary level. Though stricken with poverty and hardships, the people of Kenya are generally literate. It's estimated that approximately 90% of adult males, and 80% of adult females are able to read and write. While the basics are covered, more advanced education is not as widespread. On average, children go to school for only 9 or 10 years. One of the reasons for the high literacy rate, is that in 2003 Kenya waived all fees and tuitions for the primary school level. This has increased school enrollment by large amounts, and raised the literacy rate along with it. This has been a step in the right direction for education in Kenya. Unfortunately, children from very poor families can only keep their children enrolled for a few years, because there are still costs associated with school. There are no tuition fees, but families must still cover costs of some books, transportation, food and other supplies. Generally, there are 3 different types of schools in Kenya. Government schools, private schools and community-based "harambee" schools. 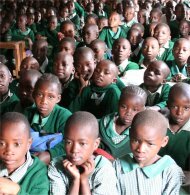 The harambee schools are the most common source of both primary and secondary level education. Approximately 75% of schools in Kenya are harambee schools. They are funded and operated by various charities and fund-raising groups. The harambee schools should not be confused with the specific non-profit organization Harambee Schools Kenya that works to provide assistance for education in Kenya through volunteers and donated supplies. They operate primarily in the area around the town of Gilgil, and do not represent the nation-wide presence of these schools. Secondary schools are not as well attended as the primary ones, mainly due to both the high cost of tuition and the selective admissions process. After primary school, children take an exam for the Kenya Certificate of Primary Education. Only those with high scores may be admitted to government secondary schools. Harambee secondary schools are an option for students with lower KCPE scores. Though only a very small percentage of students go on to post-secondary education in Kenya, there are still several schools available. 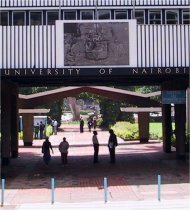 The largest university in Kenya is the University of Nairobi, which is a multi-disciplinary university with a number of specialized colleges (for studies in agriculture, engineering and health sciences). Other large universities are Kenyatta University (also in Nairobi) and Moi University, in Eldoret. There are only 5 other universities in Kenya. Other forms of post-secondary schools are vocational and trade colleges, in a wide-range of fields. There are schools for nursing, accounting, teaching, law, arts, and information technology. The Ministry of Education in Kenya is working towards improving access and affordability, so that more children can remain students into the secondary and post-secondary levels. Increased government funding will help build more schools, hire qualified teachers and allow for more tuition-free opportunities.